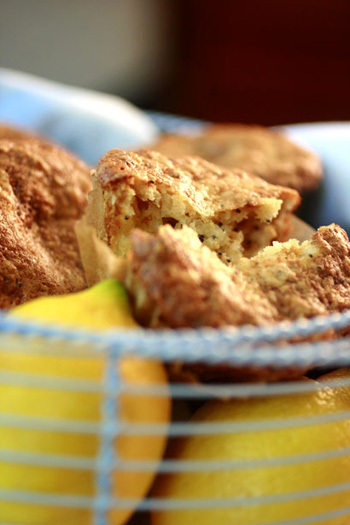 One of my youngest clients, Sarah, dubbed this lemony breakfast treat the “polka-dot muffin”. To save time, double the amount of batter and freeze half a batch in paper muffin liners. 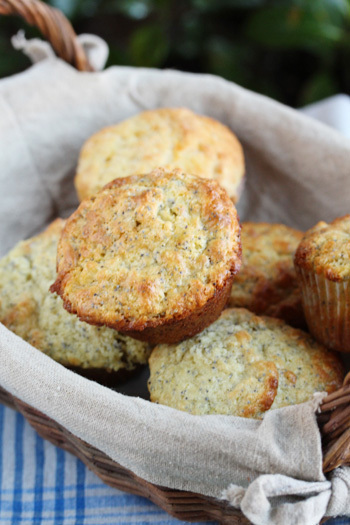 When you’re ready for another fresh- baked round, pop them into a muffin pan and bake in your pre-heated oven! Heat oven to 350° F. Grease and flour a 12-cup muffin tin or line with paper liners. Combine flour, protein powder, baking powder, baking soda, and salt in a large bowl or zipper lock bag. Stir well to combine. In a medium bowl, mix sugar and butter with a wooden spoon until smooth. Stir in eggs, buttermilk, lemon zest juice, lemon juice, and poppy seeds. Add flour and stir until a batter forms, about 10 strokes with a wooden spoon. Don’t over mix, otherwise your muffins will be tough. Fill muffin papers to the top edge. Bake for 12 to 14 minutes or until muffins spring back to the touch. Cool completely before storing in an air-tight container for up to a week. Nutritional Stats Per Serving (1 muffin): 182 calories, 7 g protein, 18 g carbohydrates, 9 g fat (5 g saturated), 51 mg cholesterol, 2 g fiber, 106 mg sodium.